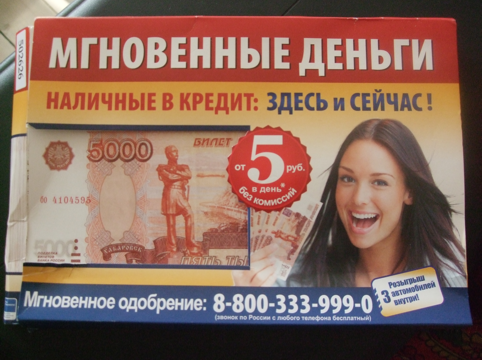 IMTFI Blog: "My credit history": new monetary practices among Altaians in the post-Soviet era. 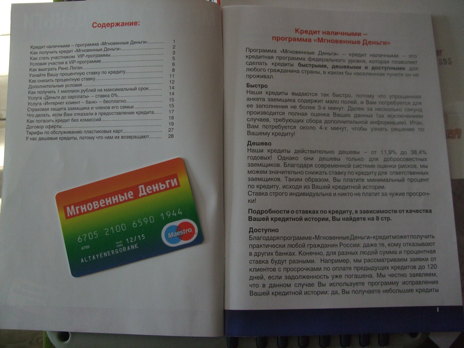 "My credit history": new monetary practices among Altaians in the post-Soviet era. IMTFI researcher Svetlana Tyukhteneva gives us an update on her work on loans in the Altai Republic. More on the project. Bank credit for private individuals among the Altaian community (Altai Republic, Russia) has only become publicly available in the post-Soviet period. Cash loans have now become an integral part of the lives of modern Altaians and people get them a number of different ways. The main objective of this project is to investigate the practices of new money among Altaians, particularly bank loans and bank credit cards. 15 interviews were carried out from July to September 2012 in the Ongudaisky district of the Altai Republic. The population of the area is 14,513 people and 76% are Altai. Respondents were chosen from among those who used the services of banks that were lending cash. The research confirmed my hypothesis, that monetary behavior among Altaians is culturally conditioned. Living in the same environmental conditions, yielding approximately the same salary, buying food and clothing in the same stores, Russian and Altaians handle money differently. INSTANT MONEY. Cash loans: here and now! 1. Bank loans became available for the bulk of working citizens of the Altai Republic in 2002. Access to credit depends on the policy of each individual bank but generally as more people take loans, they are being made more and more available. Paying them is more difficult. To take a loan you must give the bank a wage slip from an official source. Since 2012, representatives of lending institutions have begun to go into people’s work places to offer loans and potential borrowers can complete an application for a loan whilst at work. 2. After working with borrowers I have found that they can be divided fairly evenly between two groups: those people who have had a positive experience and those who have had problems. I use this division as a methodological framework. Those that have had a positive experience can be further divided into those that will borrow more cash in the future and those that won't. 3. Looking more closely at the vocabulary employed by Altaians with regard to transactions, I was immediately drawn to how expressive they were about loans. One respondent said that he "loves loans" while another person compared loans with hard-labor. Based on this, we can assume that the credit history of each of these individuals is emotionally charged and is on a par with other important aspects of people's lives. 4. The stories I gathered from respondents confirmed my idea that bank loans and credit cards are the Altaians' first "school of capitalism," the first step on the road to capitalism. Quite a lot of the people who had taken a loan with cash at least once noted that due to the loan they had begun to learn to count money and plan expenses. 5. It is worth looking at some of the purposes for which the borrowers use credit money. Among other things they are used to purchase and repair houses, buy a car, host a wedding, purchase furniture and appliances, purchase livestock and livestock feed, pay for funeral expenses and purchase expensive clothing (coats of fur). These observations and conclusions are important for my further studies. My idea is as follows: cash loans have taught borrowers to be better at financial planning, more rational and pragmatic and with more financial discipline. I would like to look more closely at Altaians representations of wealth and poverty through the anthropology of money. 6. Many respondents stated that they took loans for the purchase of furniture, home appliances, mobile phones and expensive clothes like coats of mink because they have a desire to "have it all." People still refer to the trademark "hunger" of Soviet times. According to many social scientists and economists the Soviet ideal of wealth in the form of the triad "apartment, car, house" exists in the Russian mass consciousness to this day. Consequently, most of the borrowers take loans in cash or as a mortgage to improve the quality of their lives, rationally investing in their own future and the future of their children. However, there are also those borrowers who take a loan but use it inefficiently, spending in order to satisfy transient needs. Most of the population of the Altai Republic can be classified as low-income families. Respondents explained that low-wages, unemployment and the absence of additional sources of income leads people to borrow money. The emergence of new players in the Russian banking market and the tightening of state control over the activities of banks has meant that the credit policy of banks has become more flexible. But the ease of getting credit in cash, the rather aggressive advertising of consumer credit organizations, and the economic illiteracy of the population, are all factors which can mislead people. People who do not carefully read the loan agreement, especially paragraphs typed in small print, only learn about hidden interest payments when they discover that their principal amount has remained high despite them having met the mortgage payments as required. As a result there are some people who find that they cannot repay the loan. Despite their best efforts to improve their lives, the loan ends up reducing their quality of life. On the flip side, there are a number of positive examples: loans for farm equipment have helped bring many people in villages in the Ongudai region out of poverty.